The Acacia Research Corporation develops, acquires, and licenses patented technologies, and controls 53 patent portfolios covering technologies used in a wide variety of industries such as Wireless Traffic Information, Data Encryption, Information Monitoring, Medical Image Stabilization, and others. Acacia has selected PatentCafe's Intellectual Capital Office ("ICO Suite™") patent management software solutions and its advanced patent search engine technology to support ongoing patent management and licensing operations. Our Fortune 100 customers are using the ICO Suite to build higher quality patent portfolios, and more efficiently protect and enforce their patent assets. The relevancy-ranking advantage to our customers is an annual savings of more than $10,000 per full time researcher when compared to their traditional patent search engine costs. PatentCafe announced today that it has won an award from Acacia Research Corporation for its web-based patent research solutions and secure, on-location IP Appliance Server. The Acacia Research Corporation, which develops, acquires, and licenses patented technologies, controls 53 patent portfolios covering technologies used in a wide variety of industries such as Wireless Traffic Information, Data Encryption, Information Monitoring, Medical Image Stabilization, and others. Deployment of PatentCafe's Intellectual Capital Office ("ICO Suite™") will provide Acacia with peerless patent research and data mining capability needed to support ongoing strategic patent licensing operations. "Acacia's sophisticated IP ecosystem created unique challenges for PatentCafe's solutions." said Andy Gibbs, PatentCafe's CEO. "I'm pleased that our hardware / software solutions met Acacia's requirements, and that our solutions will serve as one of the cornerstones for Acacia's own patent management solution." A company's intellectual property ecosystem typically includes an array of intellectual asset information management and research resources. Solutions include patent docketing systems, invention disclosure systems through which engineers lodge new inventions for patentability review, patent search tools to support litigation and competitive intelligence, and a bevy of technical literature files to support prior art searching. At the core of an efficient IP Ecosystem is a cadre of subject matter experts. Jacob Hawley, Acacia's Vice President of Engineering, said: "after investigating leading patent search engines and strategic IP management solutions, we chose PatentCafe's, largely because of its advanced LSA search engine. The combination of PatentCafe's international patent database and artificial intelligence technology give Acacia a powerful, secure platform upon which to continue building our proprietary in-house patent analysis tools and infrastructure." PatentCafe's ICO Suite is a scalable, flexible patent management hardware / software solution that's easily tailored to integrate into any IP management structure. 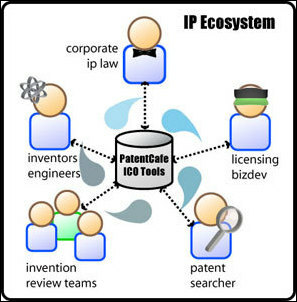 Unique to the patent information industry, the ICO Suite allows users to simultaneously search PatentCafe's international patent data center (outside of the company's firewall), and any unstructured non-patent literature collections such as invention disclosures and scientific journal articles (residing within the company's firewall). The company's web-based patent analytics tools can then statistically analyze the legal, commercial and technological factors of a patent, providing management with critical qualitative insight needed to support litigation strategy, patent portfolio M&A, technology investment, due diligence, business development and licensing activities. PatentCafe invested nearly two years into training its LSA database to understand every technology concept taught in nearly 1/4 billion pages of patent data. This resulted in the industry's only natural language patent search engine that allows researchers to use search queries up to 4,000 words of conversational English. The search results are relevancy-ranked, with the most important patents presented at the top of the list. "Our Fortune 100 customers are using the ICO Suite to build higher quality patent portfolios, and more efficiently protect and enforce their patent assets. The relevancy-ranking advantage to our customers is an annual savings of more than $10,000 per full time researcher when compared to their traditional patent search engine costs." says Gibbs. In addition to the Semantic search, PatentCafe's patent management solution incorporates another proprietary search alternative: Heuristic Boolean. Termed "SuperBoolean", the Heuristic Boolean engine is the only patent search engine that can relevancy rank Boolean hits according to proximity to a natural language query. PatentCafe is recognized as a foremost patent management solutions innovation leader, offering a comprehensive suite of intellectual property resources for international patent data research, intellectual property management, and qualitative patent analytics tools. In mid-2006, PatentCafe parted from a software-only provider by introducing the first intellectual property appliance server, a behind-the-firewall server that links with the company's data center of 23 million international patents. The IP Appliance server, along with its line of enterprise-level software applications, helps corporate and legal professionals search, develop, manage, exploit, and analyze patents and portfolios. Its products are used for patent search, patent portfolio management, industry and technology trend analysis, competitive patent intelligence, infringement analysis, patent licensing, and patent-based business information.